An aspiring artist's world is about to be turned upside down. Seishu exiles himself to a small island to rediscover his passion as a calligrapher after violently attacking one of his most vocal critics. While the Goto Islands appear to be a tranquil paradise on the surface, this young mapmaker soon learns that wacky neighbours and hyperactive children just might provide him the sense of humour he needs on his journey towards self-discovery. 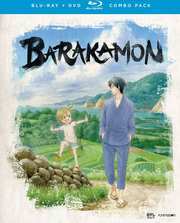 Based on the popular manga series comes a tale of finding inspiration in the most hilarious and unlikely of places. Contains the complete series on Blu-Ray and DVD with both the English dub and the original Japanese track with English subtitles.